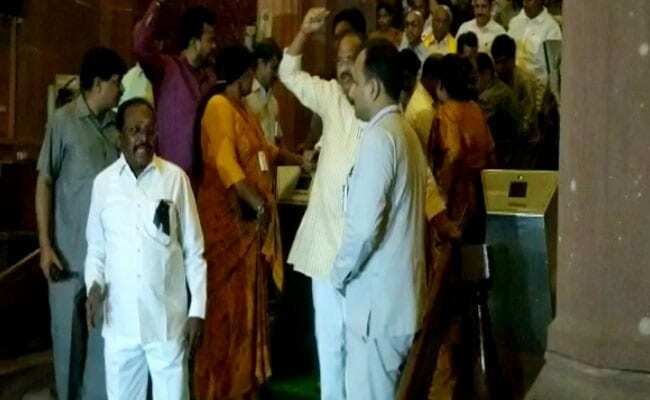 New Delhi: Escalating their demand for special category status to Andhra Pradesh, lawmakers of the Telugu Desam Party (TDP) added a new dimension to their protest by refusing to leave Rajya Sabha hours after the house was adjourned. Amidst chaos by opposition members, including the TDP, the upper house was adjourned a little after 2.30 pm but five lawmakers of the party stayed put. They were marshalled out a little after 8 pm. "After Rajya Sabha was adjourned, we remained inside peacefully demanding the rights of Andhra Pradesh. But marshals pulled us out in a rude way. They are showing their muscle power. It is an insult to people of Andhra Pradesh," said TDP lawmaker CM Ramesh. Junior parliamentary affairs minister Vijay Goel was seen pacifying the lawmakers, urging them to vacate the house citing parliamentary norms and practices. During their protest, the members were offered medical check-ups. Lawmaker A Sriniwas was shifted to hospital after his blood pressure levels dropped. Government sources say the protest by TDP lawmakers was mainly to counter another Andhra Pradesh party, the YSR Congress, whose parliamentarians are likely to resign tomorrow and begin indefinite fast. TDP lawmakers have been demanding special category status for Andhra Pradesh ever since the budget session resumed after a recess on March 5. The party had walked out of the BJP-led coalition at the centre last month after pulling out its two ministers. It has also moved a no-confidence motion against the government. "There is no respect for members," said YS Chowdary, who recently resigned as union minister.